Speed lights work in slowing drivers down, but don’t expect to see any of them here anytime soon. There are fewer tickets written because it’s harder and harder to speed. The freeways are choked most of the day. Drivers physically CAN’T speed, because most of the day Houston’s freeways are just one big parking lot. If you thought the grass roots opposition to red light cameras was something, just try putting in speed cameras. red light cameras and speed cameras are awful and Houston voters rejected this idea. 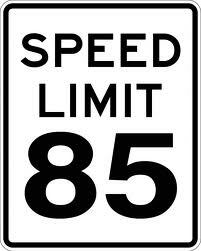 As population grows, the highway speed limits in Houston will be meaningless because of the constant traffic. Guess who wants to legislate banning red light cameras statewide? Bill, I will bite, I already knew that about the Trump lap dog wanting that. If you bothered to read, I wrote don’t expect to see them anytime soon. Besides guns don’t kill, speeding doesn’t kill, alcohol does not kill, stupid ignorant people kill. Wonder why we started putting warning on cigarettes and taxing them higher. Tobacco does not kill either. As to people who don’t smoke and have to smell they can get up and leave. Those drunk speeders don’t just kill themselves. Wonder why they make me wear a seat belt? I really don’t know what planets you all came from, there are times when one could easily go over 100 mph in the freeways. It ain’t always rush hour aliens.